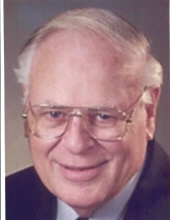 Dr. Fred Weldon Thompson, Jr. Celebrating the life of Dr. Fred Weldon Thompson, Jr.
Be the first to share your favorite memory, photo or story of Dr. Fred. This memorial page is dedicated for family, friends and future generations to celebrate the life of their loved one. Obituary for Dr. Fred Weldon Thompson, Jr.
Dr. Fred Weldon Thompson, Jr. passed away on Tuesday, February 13, 2018 at Sunset House in Toledo, OH. Fred and his wife Lois moved to Toledo from Overland Park, Kansas in June 2017 to be near their daughters Alicia Tremmel and Penny Thompson Kruse. Fred Thompson was born August 1, 1932 in Durant, OK to Fred Weldon Thompson, Sr. and Mauvolyn Thompson. Fred Jr. had a younger brother Howard Thompson who predeceased him. Fred and Lois Belle Reedy were married on April 29, 1954 in Parsons, Kansas. Fred Thompson devoted his life to the ministry of the American Baptist Churches of the Central Region and the USA. After earning his bachelor's degree from Ottawa University in Ottawa, Kansas, he graduated from Central Baptist Seminary in Kansas City, Kansas and later earned the Doctor of Ministry from McCormick Theological Seminary in Chicago, Illinois. His ministry included pastoring congregations, campus ministry, area ministry, Executive Ministry of the Central Region and Associate General Secretary of the National Office in Valley Forge, Pennsylvania. Fred Thompson is survived by his wife, Lois; daughter Alicia Ann Tremmel and husband Michael Tremmel of Norton, Ohio, daughter Penny Sue Kruse and husband Steven Kruse of Perrysburg, OH; grandchildren Emily Michelle Tremmel and Collin Gregory Tremmel; great grandson Carter Lee Lambert and niece Nancy Twillman. A memorial service will be held on Monday, February 19, 2018 at 10:30 AM at the Sunset House 4020 Indian Rd Toledo, OH 43606. Donations may be made to Sunset Retirement Communities. Arrangements were handled by Walker Funeral Home. Condolences may be shared with the family at walkerfuneralhomes.com. To send flowers or a remembrance gift to the family of Dr. Fred Weldon Thompson, Jr., please visit our Tribute Store. "Email Address" would like to share the life celebration of Dr. Fred Weldon Thompson, Jr.. Click on the "link" to go to share a favorite memory or leave a condolence message for the family.